Over the past year, I’ve looked at a lot of print advertisements for Pond’s cosmetic products. Hundreds of them at least, maybe even thousands. 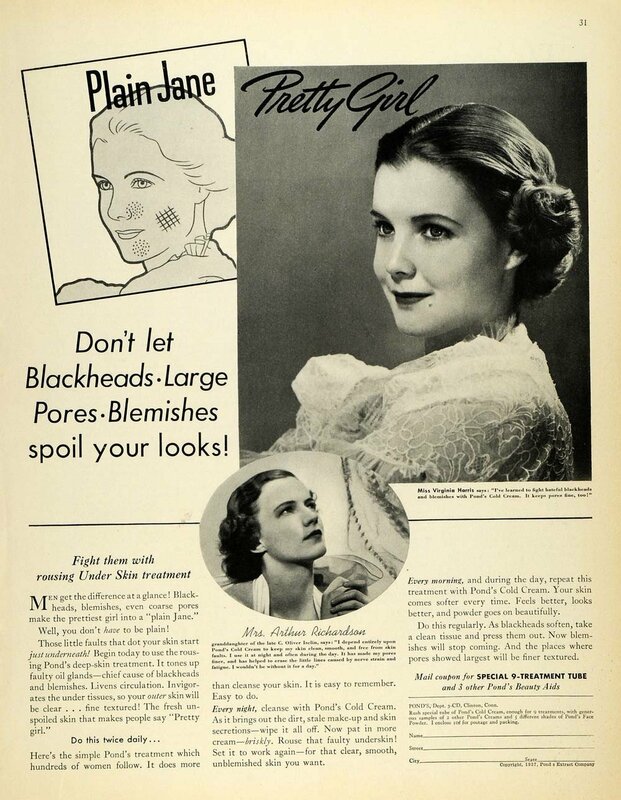 The ads promote the properties of “Extract Cream”, “Cold Cream”, “Vanishing Cream”, lipstick, tissues, foundation – you name it! They span over 100 years, with the earliest printed in 1884 and the most recent from the mid-1990s. The work of well known photographers, such as Edward Steichen or Baron de Meyer, appear in some of the ads. So what is the cause of this cosmetic ad obsession? Many familiar with the Duke’s Rubenstein Library are also familiar with the Hartman Center for Sales, Advertising & Marketing History. One of the largest collections within the Harman Center is the selected collections of the J. Walter Thompson Company (JWT), a long-running advertising agency that has worked with many well-known American companies. 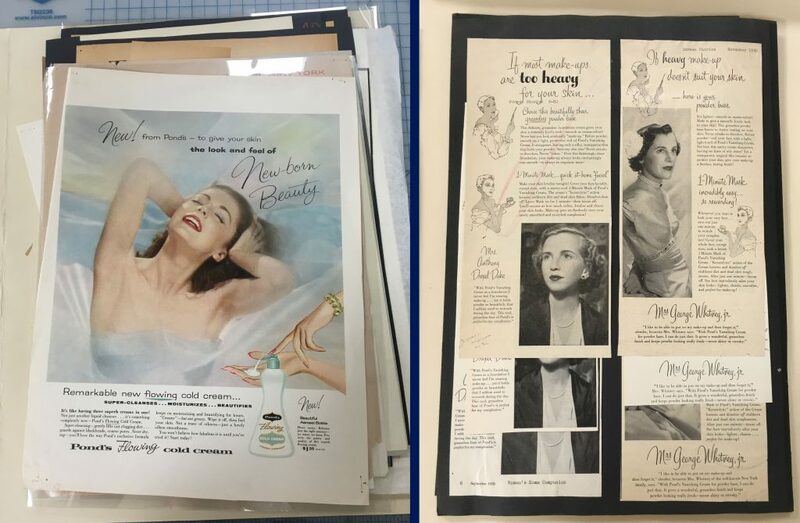 The JWT collection includes a large number of domestic advertisements for the Chesebrough-Ponds company and the materials had a number of condition issues that made handling difficult for researchers and sometime dangerous for the ads. It became necessary to go through the collection, item by item, and stabilize or rehouse items as needed. 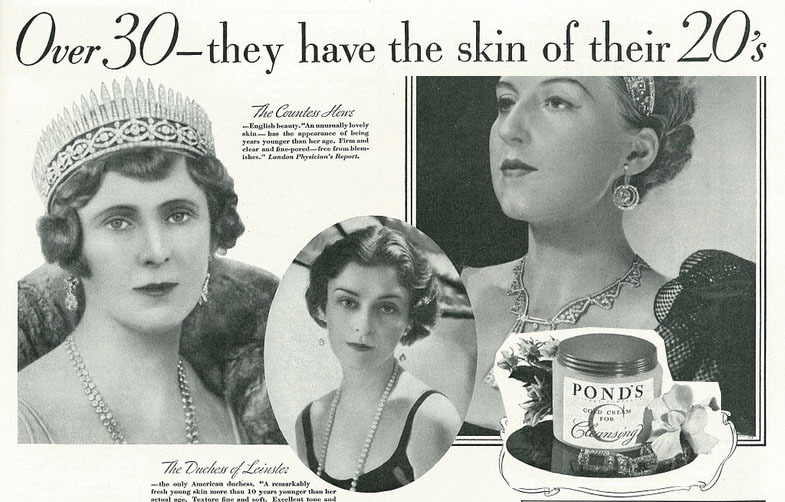 If you are curious about the name of the collection, here is a little history: Pond’s Cream was originally invented by Theron T. Pond in 1846. The original product included extracted witch hazel and was called “Golden Treasure”, but was shortly renamed to “Pond’s Extract”. The Chesebrough Manufacturing Company was founded in 1859 by Robert Chesebrough as an oil business which produced a petroleum jelly product called “Luxor”, eventually known as “Vaseline”. Chesebrough Manufacturing Company and Pond’s Creams merged in 1955, but were acquired by Unilever in 1987. The collection is stored in 22 metal-edge boxes, and each box contains many folders. Some of the folders were too small for their contents and the advertisements were susceptible to sliding around as the box was handled. These small folders were replaced with a size that fit the box exactly to reduce the likelihood of damage during transport and shelving. Each folder contains many magazine or newspaper advertisements, all different sizes and printed on different papers. They were likely retained by JWT as “tear sheets” and many are mounted to heavy black cardstock. Some of those black cardstock pages have many advertisements mounted in layers. The black paper mounts include hole punches and remnants of textile tape, suggesting they were once the pages of large scrapbooks or albums and were disbound and cut down before entering the library’s collection. The advertisements printed on newsprint have become very brittle. The larger sheets were folded down to fit on the album page and many of them have cracked along the folds. 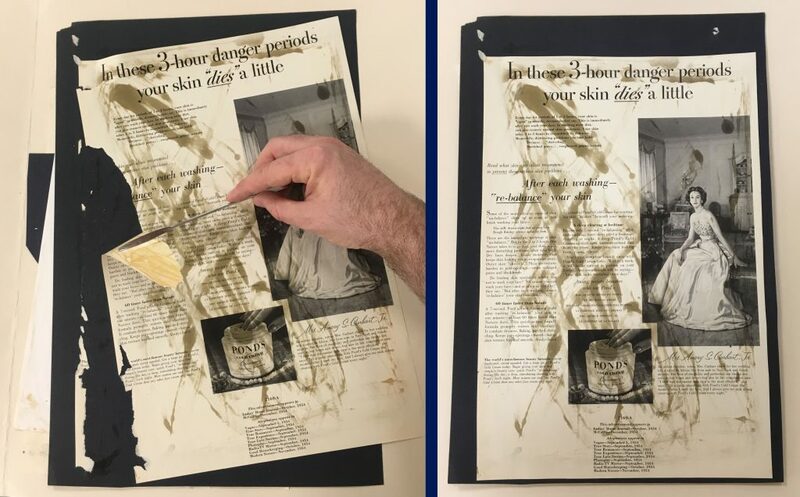 Items in this condition were repaired along the folds with thin Japanese paper, toned to match the newsprint. 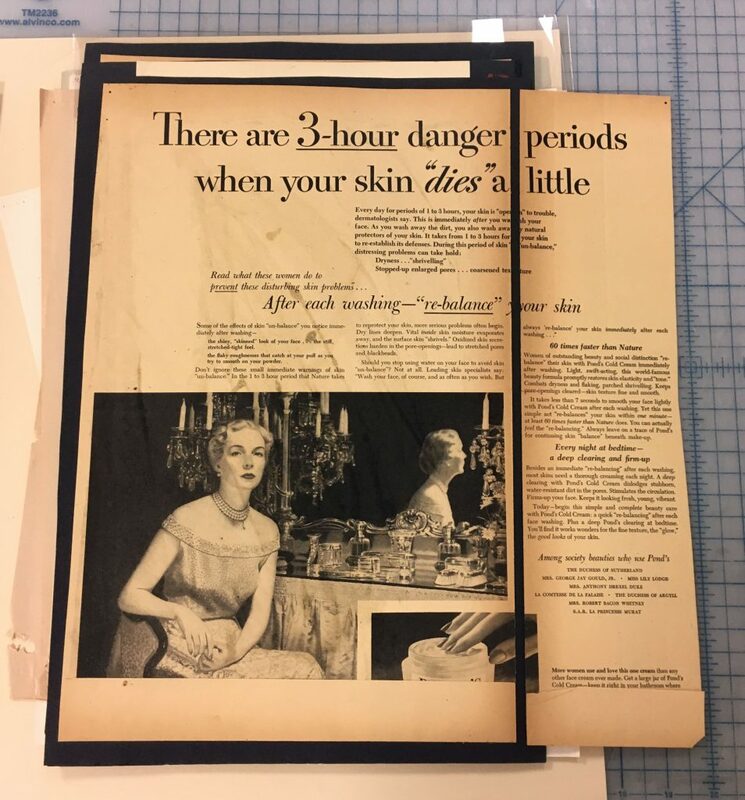 They were refolded along the original creases (now reinforced) and placed in clear polyester envelopes to protect them from further damage as researchers page through the folder. 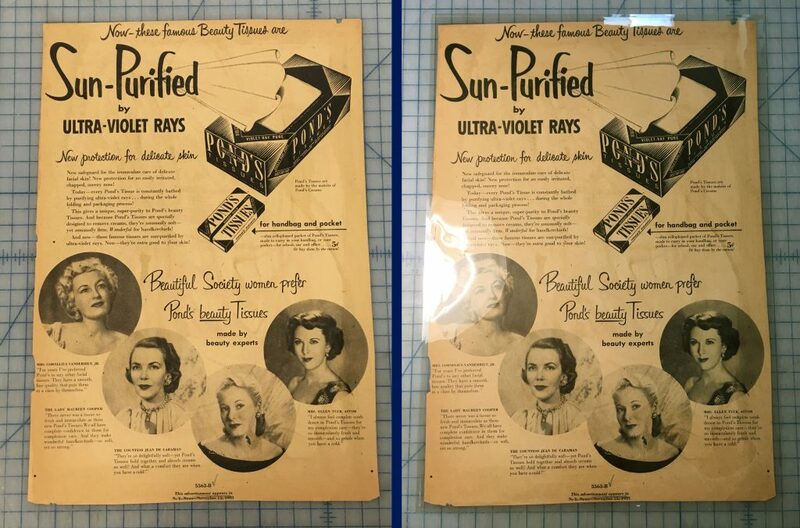 Unfolded and unmounted newsprint ads were fully encapsulated in clear polyester, using our ultrasonic welder. The adhesive mounting many of the advertisements to their album pages has failed. 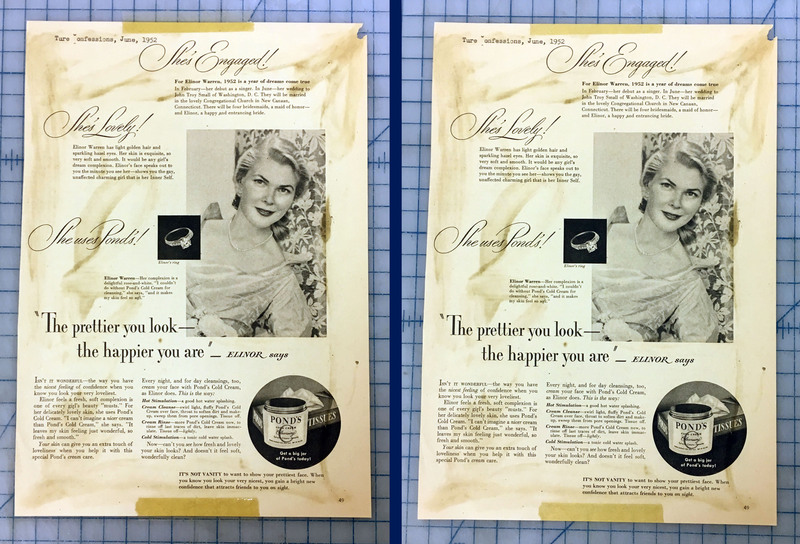 Several of them were remounted or repaired with pressure sensitive tapes, which have since oxidized and discolored the paper. Sometimes the tape adhesive had crept out from under the cellophane tape carrier and was causing the ad to stick to its neighbors. These taped items were treated by removing the tape carrier and reducing the adhesive to prevent further sticking. Unfortunately, stain reduction was outside the scope of this project. Before and after tape removal. Some of the ads that were detaching from their mounts had not come away completely. As a result, it was very easy for them to tear or to have parts torn off during normal use. The example below is pretty typical, where just the top-left corner is still attached to the cardstock mount. I was able to repair scarf tears, rejoin the separated parts, and/or re-adhere the page to the mount with wheat starch paste. Many hours have gone into stabilizing and addressing the housing needs of this collection. While the treatment has been fairly low-tech and the decisions straightforward, the results go a long way to making this advertisement collection more usable in the reading room. Quick Pic: What's On Your Boxing Cart?